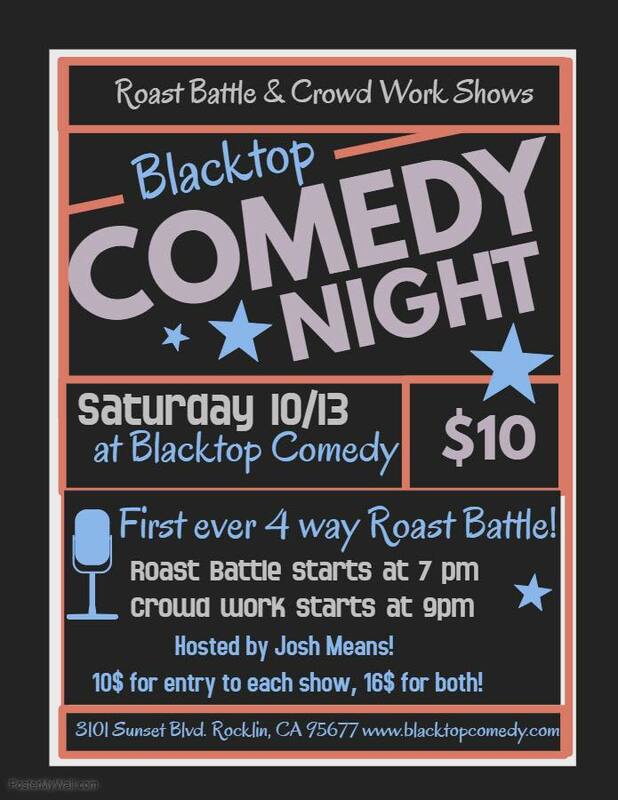 The Roast Battle and Crowd Work are is $10 online and $15 at the door. Amber Whitford is California native who has been practicing standup for almost 2 years. This is my first roast battle and I’m looking forward to being rude to my local standup comedy friends! Joe Lopez was born in Wyoming and left after realizing the only thing worth staying for was a geyser, so he moved to California. Shortly after moving to California, he emerged into the comedy scene as a vilified producer with a traveling showcase "Comedy for Cash" or his new 420 show Big Wreck Comedy." He is known for his storytelling style of jokes and is one of the few comics in Sacramento that does more than one set of jokes. You can summon him by asking to be on a show that he produced, treating him like crap behind his back and giving him a fake guest list. Sara Rooker is a comic from Reno, NV. She performs up and down the west coast from legendary comedy clubs to a dog’s birthday party. She is the two time Reno Roast Battle Champion and co host of the podcast Same Problems on iTunes. Andrea B is originally from Yonkers NY. After years of comedy in basements of NYC she moved to California and is now the co-host of the Same Problems podcast. Anthony Zuccaro is the Paul Giamatti-faced winner of the first Sac Punchline Roast Rap Battle and has been a Bay Area comic for 5 years. Credits include SF Punchline, The Monkey House in Berkeley, and recently he opened for Jen Kirkman at Cobb’s Comedy Club. Oakland, California comic Jason Cole started his stand-up comedy career in 2016 and has been grinding his way up through the ranks ever since. He’s performed at the Punch Line in San Francisco as well as Punch Line and Laughs Unlimited in Sacramento and many other notable rooms around the bay and beyond. Jason produces and hosts the monthly Standup Broadway Comedy Showcase every 1st Friday at the Sound Room jazz club in Oakland, as well as the weekly That’s Not Gravy comedy podcast (iTunes, Google Play, Soundcloud, Stitcher).